Ever since I left Halifax nine years ago, I have missed eating Mrs P’s oatcakes. They are crumbly, almost sandwich-like things: round oatcakes stuck together with peanut butter icing and dipped in chocolate. They are the perfect thing to eat, sitting at a coffee shop downtown, trying to study, but actually thinking about where life will go. Every time I go back to Halifax, I search out Mrs P’s oatcakes. If one coffee shop doesn’t carry them anymore, no, I can’t stay, I’m off to the next. A visit isn’t complete without a chocolate peanut butter oatcake (or seafood chowder, for that matter). But those visits just aren’t enough. I longed for my own oatcake source, and I realized Mrs P was probably never going to expand from her small bakery on Herring Cove Road outside Halifax to supply coffee shops in Victoria. It was all up to me. 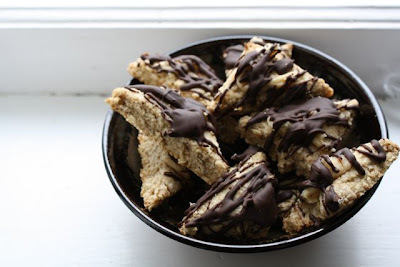 I made a few changes to make them better suit my memory, and added the chocolate and peanut butter icing, à la Mrs P. They’re easy to make – almost like making a pie with oats the way you cut in the butter and shortening. Without the chocolate and the peanut butter icing, these oatcakes are pleasantly sweet, but not overly so. In fact, I’m already looking forward to making a savoury variation, probably with cheese and chipotle. If you’re ever in Halifax, I’d highly recommend you find Mrs P’s oatcakes. But if you’re not, make these. Mrs P, thank you for the inspiration. 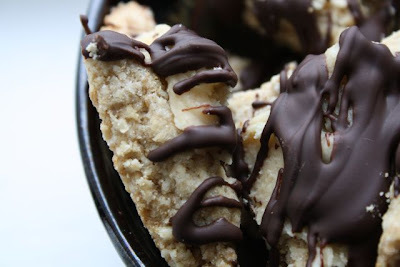 Bless you for coming up with the idea of putting oatcakes, peanut butter and chocolate together. Preheat oven to 325 degrees Fahrenheit. Line a cookie pan (or two) with parchment paper. Pulse the rolled oats in the food processor a few times to break them up. Stir the pulsed oats, oat flour, wheat or gluten-free flours, baking powder and salt together. Stir in the brown sugar. Use a pastry blender or two knives to cut in the butter and vegetable shortening. Mix well. Add a bit of cold water and stir together. Keep adding water until it holds together and isn’t crumbly (but also isn’t sticky). Use your hands to spread and pat the dough onto a piece of parchment paper. Make it about 1/3 to 1/2 inch thick. With a butter knife, cut squares. Then cut each square diagonally in half to make triangles. Place triangles on prepared cookie pan. They can be quite close together, as the cakes don’t expand as much as puff up while they bake. Bake for 7 to 8 minutes, until their edges are just golden. Whip the peanut butter, icing sugar, butter and vanilla together. Slowly add the milk until you have a consistency that is easy to spread, but will also harden well. Once the oatcakes are cooled, melt the chocolate in the top of a double boiler (or in a metal bowl suspended over boiling water). Spread each oatcake with an untidy dollop of peanut butter icing. Use a fork to drizzle chocolate over the peanut butter icing. Chill the oatcakes in the fridge to allow the icing and chocolate to harden. Spread oat flakes on a cookie sheet. Toast in 300 degree oven for 15-20 minutes until golden brown. Grind in a blender to a fine flour. I used 2 cups of large flake oats and got 1 and 2/3 cups of flour. I used 2/3 of a cup for the oatcakes today, and they taste wonderful! Marsha, I'm glad to hear your homemade oat flour worked out! Now I see I should have mentioned this in the post . . . When I went to put in oat flour, I saw it was expired. So, I put my still-good rolled oats in the food processor and pulsed until it became a flour. That worked well. However, I like the toasting idea -- I imagine that would keep them from becoming too sticky if you pulsed them for too long. Stephanie, I am from Halifax but have been living in Scotland for the last 10 years. Surprisingly, there is nothing like the wonderful Mrs. P's oatcakes in this country, and whenever I pay a visit back to Halifax, I comb the coffee shops like you to find them. Thank you so much for posting this recipe, I can't wait to try it out - I actually can't believe I have waited 10 years to go down this road of making them myself, I hope they taste like home! I'm leaving Halifax soon (more specifically Herring Cove itself, home of Mrs. P's) and have been searching for a way to make these after I cannot buy Mrs. P's anymore. Thank you! Can't wait to try them. hers. I can't wait to try this recipe. i'm a pregnant haligonian with a crazy oatcake craving living in australia! off to make these right now! thank you! Just returned from Halifax where (almost) an entire suitcase is devoted to oat cakes that we bring back with us. We go directly to the bakery where the owner always, always packs extras and wraps them for our journey. While waiting there was a woman from North Carolina getting some for her son to take with her on her flight as well. I do like an oatcake on occasion, but it is my husband who never had a Mrs. P's oatcake until a dozen years ago who covets them so. Every once in a while I will scour the internet searching for a recipe I might try. So, a little over a year past your original post I found your recipe---and it looks like the one that "needs" to be tested. OMG!! I used to buy Mrs P's oatcakes in Halifax. They are the ONLY oatcakes I like. This is the 1st first recipe that has come close to her recipe and they are delicious. Thank You for posting the recipe. Thanks Stephanie. We enjoyed very much. Can't wait to try the curry recipe with the spice you gave us as well. Mrs.P's are the best!!! My mom is actually bringing me some when she visits in May, and I'm in Edmonton :)) In the meantime though, I am desperate for a good Oatcake recipe, and this looks delish. Thank you! OMG! I have to try this. Mrs. P's are the ultimate...Thanks for posting. Great recipe. Great proportions. Here are some variations to try. Instead of rolled oats, use scottish oats -- which look like ground down rolled oats. I'm sure that's what you're going for with the food processor. I drop the shortening and replace it with a few tablespoons of neutral oil. I use 1/2C milk instead of water for better browning. Also, I melt the butter in a pot and then add all the wet. Having warm wet ingredients seems to make it easier to handle. Also, for browning, I bump the oven up to 400C and bake for 20-25 min (!). Costco in Halifax and Dartmouth carries them. Thanks for the recipe. I live in Montreal now. For a city with so much food, they've never heard of oatcakes! Stuck in the Capital, my NS Mister and I have been missing oat cakes something fierce. These have really hit the spot - Thank You!!! I love Mrs. P's oatcakes too!!!! And I live in the states so I miss oatcakes something fierce - I can always find Mrs. P's at http://tridenthalifax.com - a bookstore cafe at 1256 Hollis and apparently the local Costco sells them bulk (imagine!). I can't wait to try your recipe (though I like them plain). Thank you for this recipe. I'm a Haligonian living in Calgary and every time I'm home, I stock up on Mrs. P's oatcakes but they never last long! Looking forward to trying these tonight!